Paul Whelan's Arrest In Moscow Draws Parallels To U.S. Journalist's Case In 1986 Nicholas Daniloff was seized and charged with spying in apparent retaliation for the U.S. arrest of a Russian agent. Daniloff discusses the similarities with the detention of U.S. citizen Paul Whelan. U.S. journalist Nicholas Daniloff and his wife, Ruth, display a T-shirt on his return home to the U.S. after being arrested in Moscow in 1986. Russian authorities seize an American in Moscow and charge him with spying for the U.S. while his family protests his innocence. This is not just the story of Paul Whelan, the American citizen detained in the Russian capital on Dec. 28, 2018. In 1986, KGB operatives arrested American journalist Nicholas Daniloff for the same crime and locked him in the same prison. The parallels don't end there. Daniloff's detention came days after the U.S. arrested a Soviet aide at the United Nations, Gennady Zakharov, as he allegedly gathered classified data in New York. Whelan's arrest comes after the U.S. charged a Russian woman, Maria Butina, with failing to register as a foreign agent last summer. "It looks like the Russians are trying to set up a one-on-one exchange, Whelan for Butina in Washington, and to tell you the truth, I'm surprised that they didn't arrest an American sooner than they did," Daniloff, who is 84 now, tells Morning Edition host Rachel Martin. In 1986, the Kremlin was quick to retaliate. Upon receiving what he says were planted documents from a Soviet person who was a source (and who Daniloff thought was a friend), the American was arrested, interrogated for hours and charged with spying — a crime that could have brought the death penalty. Daniloff's wife, Ruth Daniloff, championed her husband's case to the press and Soviet officials. 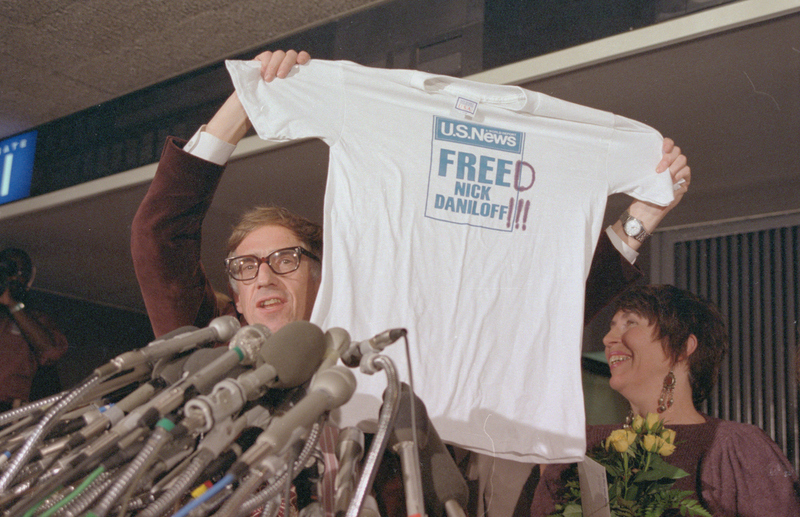 The Reagan administration negotiated Daniloff's release on Sept. 29, 1986. He had spent almost three weeks in prison and another two weeks waiting to leave the country. The U.S. released Zakharov the next day as part of a wider deal with the Soviet Union. Daniloff wrote about his experience for U.S.News & World Report and penned a memoir, Of Spies and Spokesmen: My Life as a Cold War Correspondent. Essentially, they arrested me after I had been given some material by a person that I thought was a friend and a source that's a Russian. Some of that material seemed to be photographs of Soviet soldiers in Afghanistan. And I was carrying this package with me when they arrested me. It was something that they had clearly planned for some time. Now, in the case of Whelan, what it seems to me they're trying to do is to fabricate a case of espionage against him. They're pretty good at doing that. I remember a great deal. I was arrested by an arrest team, thrown into a minibus, handcuffed, taken to a prison, where I was then brought up into an interrogation room and interrogated for about four or five hours. At the end of that time, I was permitted to make a telephone call to the U.S. Embassy. But it was a Saturday, and I knew that the only person I'd get at the embassy was a U.S. Marine, so I called my wife. And she raised holy hell. She organized essentially a big media campaign against the Russians for doing this and the whole thing took off. It became an enormous international incident. I was in a cell with a cellmate. Sometimes it was cold in that cell. The one thing I would say is that I was not tortured physically, and I wouldn't expect Whelan to be tortured physically. But what you have to understand is that when you are snapped off a street, thrown into a prison, denied access to your embassy, you are being subjected to mental torture.